Marjorie Collins is a name familiar to those studying missions. (She’s authored 25 missions books and published hundreds of articles.) In this book, she basically creates a “candidate orientation to go.” This book would be most useful for a prospective recruit who is curious about “how to get from here to there.” It would fill in SOOOO many gaps in the process and calm many fears. Order it directly from the author by sending $7 (includes postage and handling to those in the USA; others, please inquire) at 1089 Kumquat Ct., Orange City, FL 32763. Whoa… I just finished reading Greg Carter’s new book, “Skills, Knowledge, Character: A Church-based Approach to Missionary Candidate Preparation.” There’s just one major flaw in this book: I didn’t write it first. Honest… I read it cover-to-cover, word-for-word, because it’s that good. He analyzes the typical preparation track (at least for USA-sent workers; other countries’ mileage may vary), picks apart the process, and helps figure out how to improve it. I *love* it that he blends the agency’s role with the church’s role. (He notes that some churches back in the nineties were previously heading in a direction of ditching agencies. “Big mistake,” he concludes. My kinda’ guy. :-) ) (Course, I lead a missions agency on the side, in addition to my role of editing Brigada. :-) ) He also blends in special training agencies *and* formal college/university training experiences. Actually, the appendix and his “dashboard” are worth the price of the book all on their own. 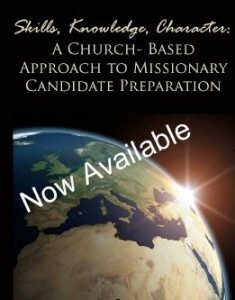 Seriously, all kidding aside, you’ll want this book… if you’re involved in local church missions. So hats off to Greg. This book is a keeper.